Back home in Alaska at last! 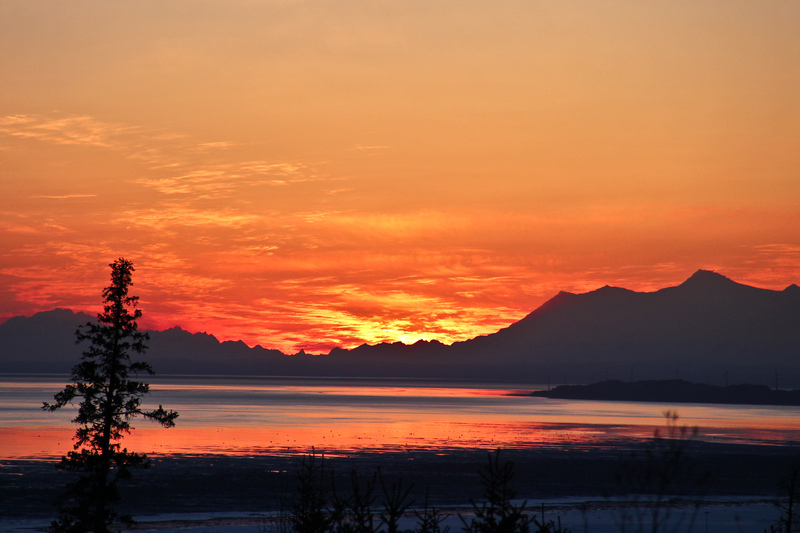 After a long season on the road it was awesome to come home to Alaska for Supertour finals. 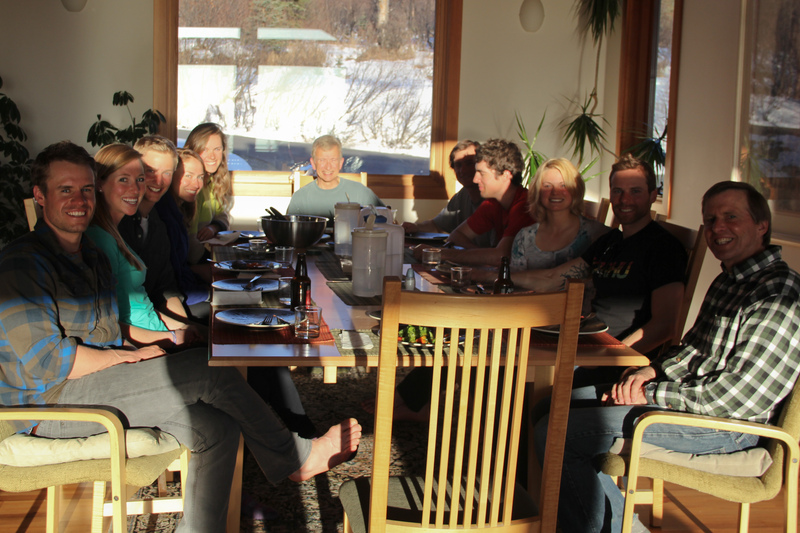 The weather could not have been better with sun all week long, good skiing and great company. We had the whole SMST2 crew in town staying at my parents house. It was fun to have everyone under the same roof. During the season we split into two groups, one on the World Cup and one pursuing the Supertour (to get on the World Cup). The team hadn’t all been together in one place for over five months. Team dinner. It was really good to have everyone together. My parents cooked some awesome meals to keep everyone fueled for the races! Left to right: Simi Hamilton, Erika Flowers, myself, Sophie Caldwell, Annie Pokorny, my dad, Gus Kaeding, Ben Saxton, Jessie Diggins, Andy Newell, and Sverre Caldwell. My week started out with the Classic Sprint race. The course had a good layout and was one of the more challenging courses we’ve seen this year, finishing with a big climb into the stadium. 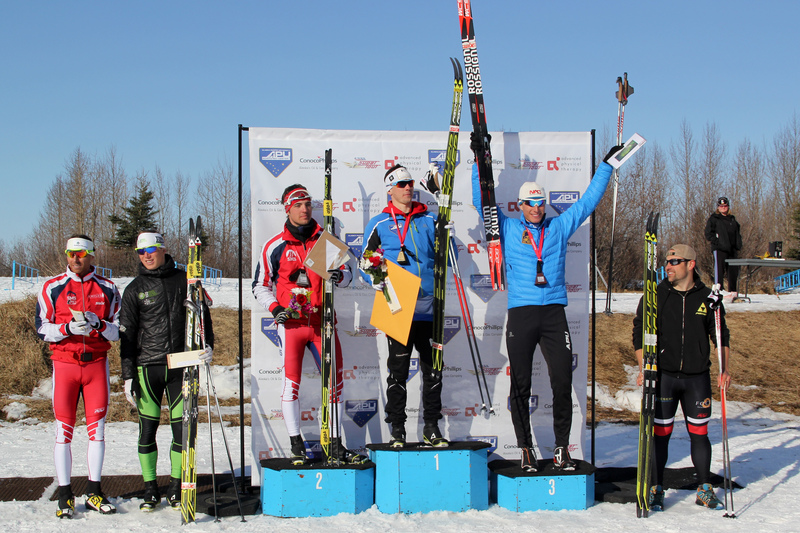 This year I’ve been experimenting with double poling classic sprint qualifiers on skate skis. To be honest, I prefer striding BUT very few sprint courses in the US are challenging enough and often double pole is faster Most skiers on the supertour – and definitely on the World Cup – can double pole an A-climb without too much difficulty. Even if some time is lost on the climbs by double poling, it still can be faster to go on skate skis because without wax the skis run much faster on the flats and downhills. 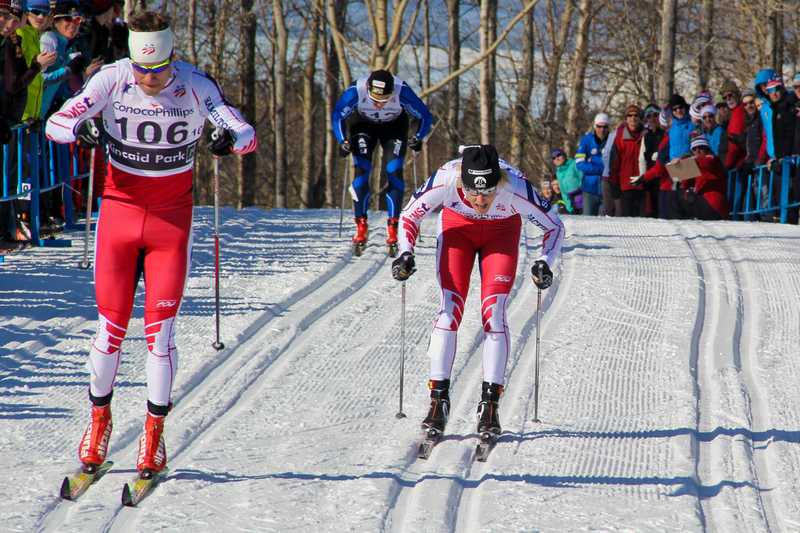 It generally takes two big climbs – or one big climb with an uphill finish – to really force skiers to stride. 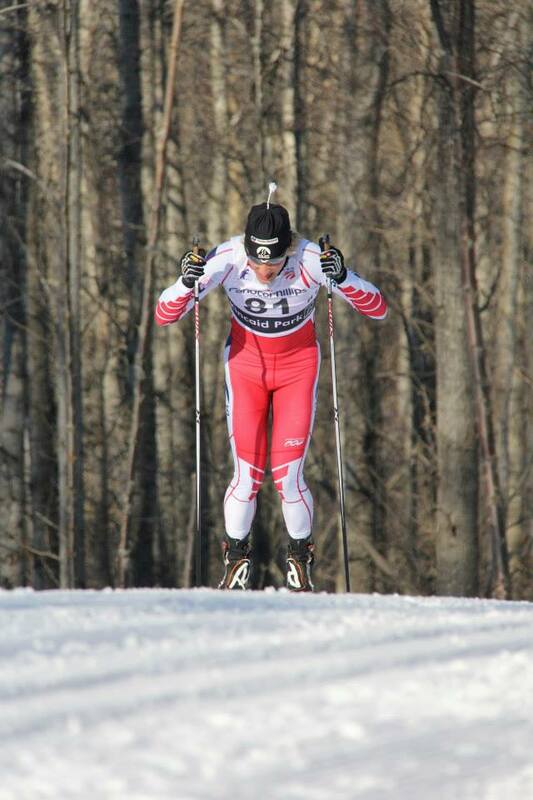 So far in the season I’d raced four classic sprints, three of which I double poled on skate skis for qualification. In those qualifiers I’d finished 1st, 2nd, and 1st respectively, which has given me a lot of confidence in my double pole, even over relatively challenging terrain. Figuring that sometimes you need take a risk, and I went for it and double poled the qualifier. I had a great first 1200m of qualifier, but 150m from the finish, halfway up that last steep pitch, I knew I was in trouble. I hadn’t realized how tiring the gradual climb leading into that last pitch would be, and my arms were loading up with lactic acid. It felt like I almost came to a complete stop between pole plants, and the last 20m over the crest of the hill seemed to take a lifetime. Inch by inch, I poled over that crest and finally made it up and over. I tried to build back some speed to carry into the finish, but to say those last 60 meters were a struggle is an understatement. In the first five minutes after finishing the qualifier everyone who watched gave me the better-luck-next-time look, and I was sure I was out for the rounds. Then the results popped up, and I realized I’d qualified in 9th! It was a huge surprise. As always, double poling turned out to be faster than expected! It was definitely a mistake on that course, but even so, I was right in the mix for the heats. I did decide that I’d learned my lesson and immediately resolved to go on classic skis for the rounds, but it was also a lesson that more times than not, double poling can be a good option. The heats were nothing special for me – after the qualifier, I had a hard time recovering the strength in my arms.. The quarterfinal went well, but by the semi I was more or less out of gas and struggling to stay with the lead. The highlight was coming into the finish of the Semifinal with teammate Simi Hamilton. I finished 9th overall on the day. Andy and Ben both had great days and skied strong in the final. In the end, all four of our guys placed in the top 10. Andy and Ben on the podium. 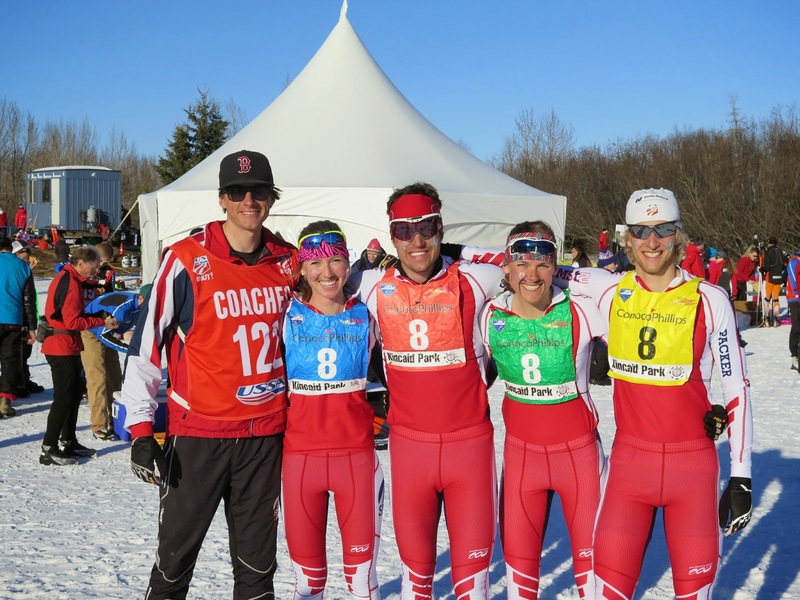 The next race on the schedule was the first ever mixed team relay National Championship. Each team consisted of two guys and two girls. We’d been talking about the race all season and among the athletes there was a ton of excitement. We fielded two teams for SMST2. Our top team consisted of all Olympians with Andy, Sophie, Simi, and Jessie, and our second team was Ben, Annie, me, and Erika. The relay was by far my favorite race of the year and individually, one of my best efforts. Hitting the climb in the team relay. 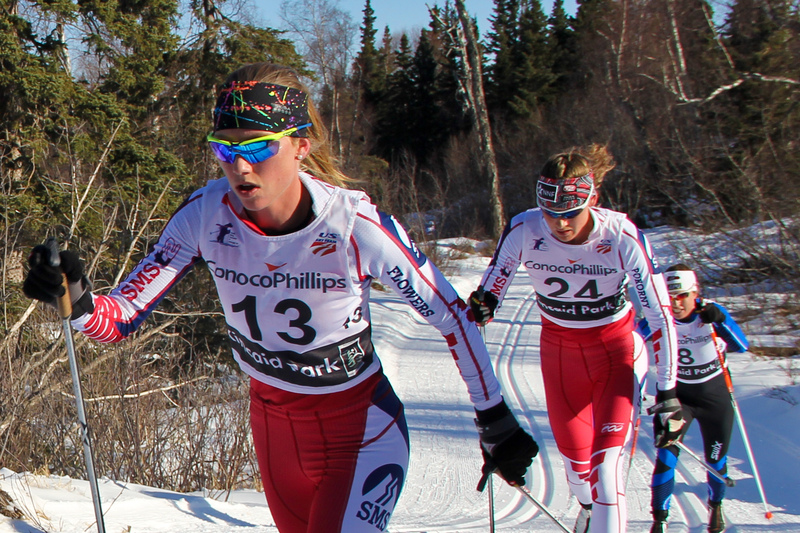 Everybody on my team skied really well, and Erika skied a badass anchor leg to bring us in the finish in 4th overall, far exceeding our pre-race ranking of 8th. Our first team from SMST2 finished in 2nd. Two teams in the top 4, not bad! The last race of the week was the 30/50k at the hillside trail system. The course they had set included five laps of the super-hilly Spencer loop. I learned how to ski on those trails and it was the place where I did most of my training in high school. It was fun to race on a true home course! The day started with the girls 30k race. Erika and Annie sporting our new podiumwear suits and racing hard. Each one is customized with the person’s last name printed on the bicep! Our girls crushed it and all ended in the top 10! The 50k was definitely one of the harder 50k’s I’ve ever done. The race started out under control on the first lap, but quickly accelerated on the second lap once we hit the climb. I got dropped off of the lead group of 10 about halfway up Wall Street, the biggest climb on the course. I should have pushed harder – once you’re off the group, its almost impossible to catch back up. 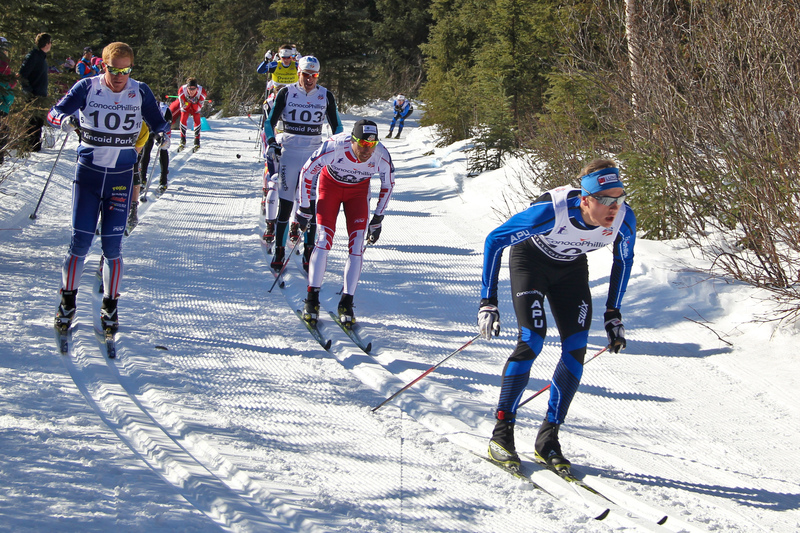 I skied with a small group for the next lap, and at the 25k mark went off the front alone to try to catch any stragglers that might fall off the lead pack. Once you’re alone in a 50k, the race becomes a true test of what you’ve got. There is nowhere to hide and nobody to pace you. For me, I’ve found that it becomes extra important to feed well. 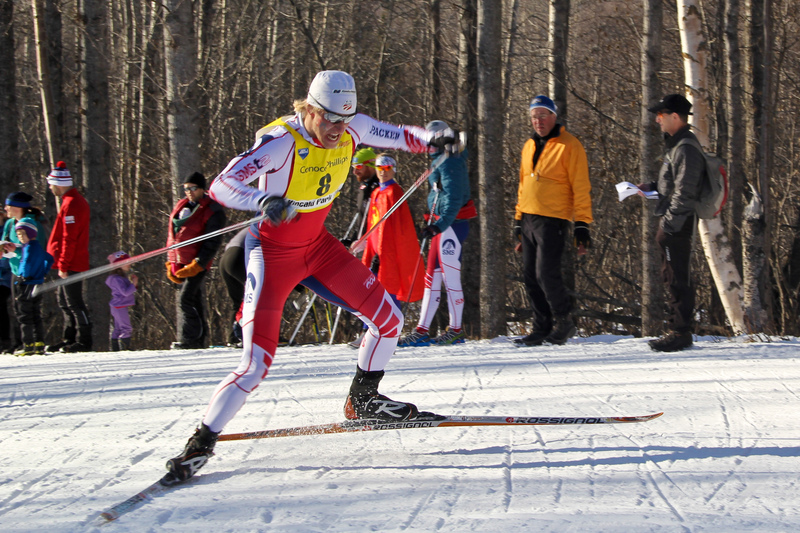 (Skiers take feeds throughout long races to keep sugar levels up and maintain hydration.) My best 50k efforts always come when I feed well. In this 50k, I ate one Powerbar Gel per lap (five Gel’s total) as well as taking three 4-6 oz diluted gatorade feeds per lap (15 liquid feeds total). It was enough to keep from bonking and keep me moving those last laps when I was racing alone. I ended up skiing alone for the last 25 kilometers of the race. On the last lap I caught a glimpse of a New Mexico skier in the distance, and that gave me life for the final kilometers of the race. I passed him with 3k to go and didn’t look back finishing in 11th overall and 9th American. I was very happy with the effort and raced well given my fitness this year, but want to be high up on the results sheet next year. Way higher. Just like that another season has come and gone! Now its time to rest, reflect, and look forward to a new year of training and racing. Thank you to all the sponsors and supporters who have helped me this year! Among them: Alaska National Insurance Company, Rossignol, Girdwood 20/20, Rich Suddock, Jack Hoops, my parents, and many others! Also thank you to the many people who have opened their homes to me this season, and who have helped me along the way. Lastly, thanks to my coaches, Gus Kaeding and Sverre Caldwell, who worked tirelessly this year to help me succeed! Without you all, ski racing would not be possible. Tomorrow I head north of the Arctic Circle to Anaktuvuk Pass to volunteer with the SkiKu/NanaNordic program. Should be a great adventure!